On November 30th, I will be participating in the 3rd Annual Challenge of Color Blog Hop hosted by Erin Prais-Hintz Tesori Trovati Jewelry - Treasures Found and Brandi Hussey of Brandi Girl. Their inspiration came from NASA Earth As Art photographs. Brandi chose 40 of those images and developed color palettes for each. Then each of the 80 participants was given two palettes from which to choose. 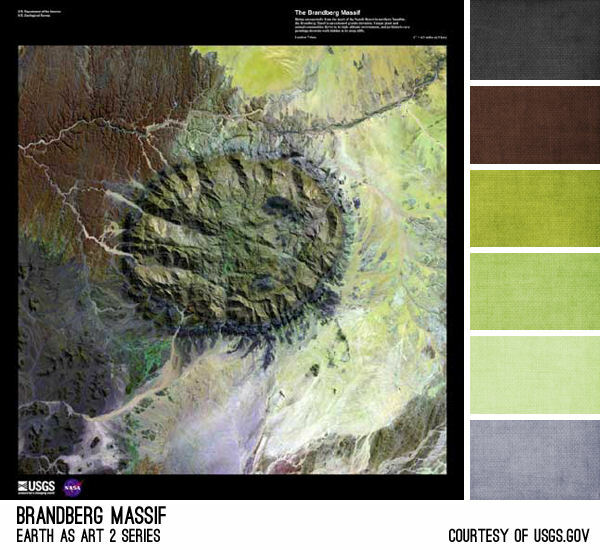 The challenge is simply to create an accessory item using one of the palettes. I had a terrible time choosing between my two palettes - the one above is the one I didn't choose to do for the hop! I just couldn't resist working with it, though, so you're getting a pre-blog hop self challenge. The image above is called Desert Patterns. 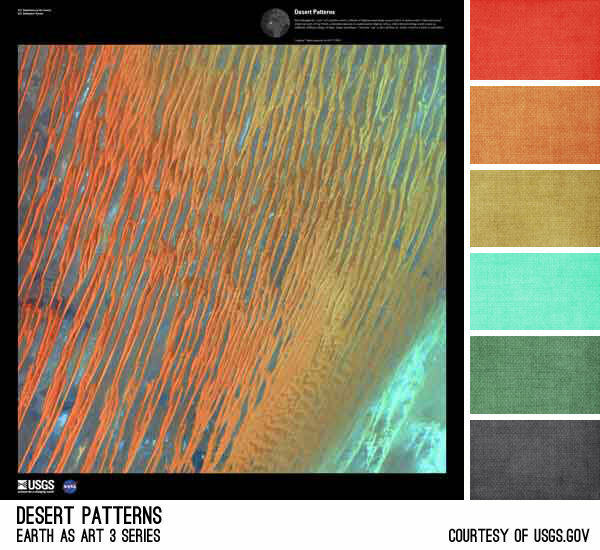 It is described as ribbons of Saharan sand dunes seen through the "eyes" of a satellite sensor. The sunset colors seem to glow. The patterned stripes are part of Erg Chech, a desolate desert in Algeria where the winds create an endlessly shifting collage of large, linear sand dunes. It's an incredible image. You can find it, and many others here. I went through my bead stash and came up with quite a few possibilities. I had seed beads and cord in most of the colors, along with some African recycled glass, some painted lucite, Czech glass and a few varied focal pieces. I wanted a pattern that would mimic the undulations of the sand. This was my first try. I just wasn't feeling it. It was pretty and colorful, but just didn't capture the feeling of the photograph, so I started over. This time I used the dark gray cord and just arcs of color. I'm much happier with this second attempt. I think it more closely mimics the texture in the picture and the color is punctuated by the gray. This palette was much more of a challenge for me than I thought it should be, especially since I should have been concentrating on the palette I did choose. I'll give you a sneak peek, but you'll have to stop back on the 30th to see what I come up with for it! This is really cool, love background leading to the challenge selections. Outstanding interpretation, look forward to seeing your entry and the volume of work. Good luck! Beautiful colour choices (well actually both bracelets)Sherri! I just love the second palette and can't wait to see what you create for this Friday's reveal! I love both bracelets. I like the colorful one but the dark gray makes everything pop. I love what you did with the first palette! As gorgeous as that one is, I can't wait to see what you reveal on the 30th. It's a gorgeous work, congrats! Outstanding! These are absolutely beautiful! Sherri, I only play with beads for my enjoyment and I am always amazed at what you talented artists can do with such a small piece of glass. My oh my this is beautiful. I can't wait to see your other palette. I love the dark charcoal cord with the oranges and blue - just makes it all pop and you can feel it - awesome work as always! I love both pieces that you made but the Desert Patterns bracelet really speaks to me. The colors and design are *delightful*!